MediaWiki language extension bundle 2012.12 was released just before Christmas. It is compatible with MediaWiki versions 1.20 and 1.21alpha. Downloads and installation instructions can be found at https://www.mediawiki.org/wiki/MLEB. Announcements of new releases will be posted to mediawiki-i18n mailing list. English name for Azerbaijani (arz) was added. A bug that caused local names for be-tarask not to be used was fixed. Translations for be-tarask were updated. Lots of development is ongoing on the translation user interface redesign project conducted by the WMF Language Engineering Team. 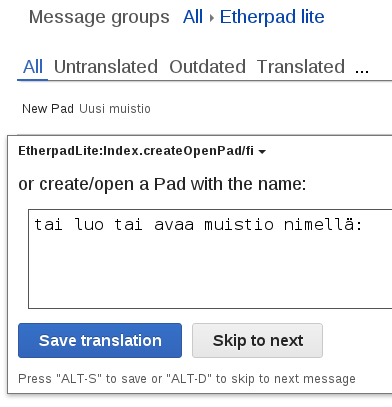 New message list and translation editor (pictured) are in alpha stage, but interested users can activate them by using URL parameter tux=1 while on Special:Translate. Also, tux=0 gets back the old interface. $wgTranslateAC and $wgTranslateEC were removed. If you were still using these, switch over to the TranslatePostInitGroups hook or $wgTranslateCC. Bundled Solarium library was removed. Install it manually or use the MediaWiki Solarium extensions. Sneak peek from the new translation UX: the new group selector (top) and part of the revamped translation editor. ApiQueryMessageGroups module has lots of new functionality. There is new ApiQueryLanguageStats module. Fixed a display issue in the Modern skin. You are currently browsing the It rains like a saavi blog archives for December, 2012.